Albert Edwards remembers the 1987 equity crash "as if it were yesterday." Albert brings up this particular diversion from the real risks facing traders on that October morning in 1987 because it represents a lesson "that when policymakers have a ‘good’ crisis, investors then become over-complacent and fail to price risk correctly." It wasn't just Black Monday: as Edwards notes, in 2001, in the immediate aftermath of the Nasdaq crash and with the expected deep recession averted, investors made the mistake of anointing Alan Greenspan with semi-supernatural powers of policy management "whereas in fact he might have just been lucky." He was. Alan Greenspan and the Fed were seen by investors to have had a good crisis, and together with Greenspans mythical equity market put, investors became overcomplacent. The bust, when it came, was worse, precisely because over-confidence in policymakers ability to control events led to excessive risk and debt being taken on. ... are virtually certain that China's economy will not hard-land, mainly because the policymakers have proved the naysayers wrong time and time again. But, as in the case of 1987 and 2001, "is luck now running out?" Edwards asks, this time for Beijing. Edwards' argument revolves around the claim with China's policymakers having had a very good crisis in 2008 (which was papered over only thanks to trillions in new debt, as Kyle Bass' tweet above shows), "since then, naysayers, such as myself, have been consistently wrong in projecting that policymakers would lose control and that a grotesque credit bubble would burst and lay the economy low." And yet, just like in late 2015, with the sharp swoon that followed China's devaluation and the bursting of its stock bubble, once again fears are growing about the Chinese economy slowing rapidly, even if few fear a bust. Instead, Edwards contends that as President Trump exerts mounting pressure on the Chinese economy via tariffs, "the worry is that a Chinese policy response will send the global markets into a tailspin, just as the August 2015 devaluation did." Which, in turn, reminds the SocGen strategist that, as we reported back in August, China just unveiled its first ever current account deficit, marking a seachange in the direction of China's capital flows, and making Chinas policymakers job even harder, once again bringing up the question: "Is luck running out?" Of course, the current account is just a symptom of an greater malady affecting China: namely a rapid slowdown in Chinese growth. 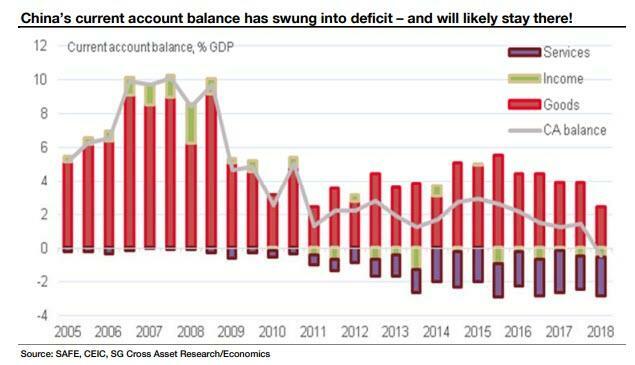 Referencing the recent work of SocGen China economist Wei Yao, Edwards notes that the swing into current account deficit shown above is likely to be permanent. The result will be increased fragility in the renminbi "at a time when economic growth is slowing sharply, led by the industrial (secondary) sector (see left-hand chart below). And with export growth to the US only temporarily buoyed to avoid tariff hikes, this slowdown is likely to intensify." Even more troubling than China's brand new current account deficit is that as Yao highlights, the Chinese economy has slowed to the point that employment has begun to fall, most visibly in the slump in the latest employment component of the PMIs (both official and Caixin). And while the decline in manufacturing jobs has been apparent for a few years now (ie sub 50), but it is also the services sector that is now also shedding labor, making China's economic slowdown a "really serious" issue for policymakers. Meanwhile, the traditional response Beijing has activated in such situations - namely blowing a massive credit bubble, no longer appears to be an option as Chinese policy seems "to swing from feast to famine as policymakers grapple with the increasing instability of the credit bubble they have created." The main reason cited by the SocGen economists for the policymakers' reluctance to blow yet another bubble is concerns about how it will affect China housing market, where the issue is that Beijing's credit policy swings about so violently it destabilizes a housing market that is constantly prone to bubble tendencies (see chart below). This, Edwards believes, is due to few alternative investment opportunities - especially after the 2015 H2 equity market collapse. And here Edwards makes a bold assumption: "after the aggressively expansive monetary and fiscal policy of 2015/16, the authorities remain determined not to reignite the credit bubble." Perhaps, or perhaps Beijing simply has not had a reason to pull out all the debt stops just yet in the past 3 years, ever since the Shanghai Accord of early 2016 unleashed another debt tsunami across China, whose aftereffects have kept the economy afloat. Still, one can argue that Edwards is correct, especially when one looks at the overall public sector deficit which is already at 2009 crisis levels of 11% of GDP, as creation of China's shadow credit - the deus ex machina for the past decade - continues to be "strangled." As a result of these trends, the SocGen strategists describe Chinese policy easing in the face of the current sharp slowdown as only "half-hearted" and demanding for more stimulus from Beijing to avoid a sharp economic contraction. Which in turn brings us back to the start of this post, and the lesson from 1987, because whereas everyone is focusing on an entirely different set of problems, Edwards cautions that "no one expects a [Chinese] hard-landing" and asks "Why not?" If he, and Kyle Bass are right, we'll get the answer to this question very soon.